A strange Atlus Faithful email from 1999 appears to hint toward the PSP release of Persona 2: Innocent Sin. Anyone on the Atlus Faithful email list may have gotten a strange message today dated from June 23, 1999. A mistake perhaps? A joke? Apparently not, if you're able to decipher the hidden message inside. The email contains a fan editorial on whether the PlayStation or the N64 is better, a staff editorial on the impending Y2K disaster, a mention to keep an eye out for the PS1's Tail Concerto, and a movie review awarding 3.5 out of 4 stars to the newly released Star Wars Episode I: The Phantom Menace. Weird, right? While I thought the mention of Tail Concerto meant Atlus was bringing its DS sequel Solatorobo to North America, a more likely hint was found. At the very top, a line of text reads: "This Week in News: Absolutely no new games releasing today in Japan." Now why would Atlus point that out? Kotowari did a search and discovered that June 24, 1999 was actually the Japanese release date of Persona 2: Innocent Sin (which could be June 23 in North America, depending on the time). Coincidentally, a remake of Innocent Sin was recently released for the PSP in Japan! 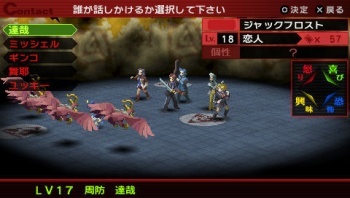 Innocent Sin is the second classic Persona game to receive a PSP remake, following Shin Megami Tensei: Persona which came to North America in September 2009. For those wondering if the PSP version of Innocent Sin would also make its way out of Japan, it looks like the answer is "yes." The best part is that Innocent Sin has never been released in North America. Atlus brought over Persona 2's "second scenario," Personal 2: Eternal Punishment, but kept its hands off of Innocent Sin due to controversial gameplay aspects such as an appearance by one Adolf Hitler and religious themes. Now that we're in the time where things like that are tame, North America can finally get a taste of some never-before-seen Persona goodness. Keep an eye out for more Persona 2: Innocent Sin PSP communication on Atlus's front in the near future.